The Program Unit on Faith, Witness and Service has the main task of making church people better critical thinkers and responsible members of society, projecting the NCCP and all it stands for in the local and international communities and ministering to the needs of the poor and the marginalized to uplift their condition. The development education and training of the Program Unit on Faith, Witness and Service (FWS) is designed to provide NCCP partners and church members with opportunities for theological reflection on and training for advocacy work in peace, human rights, ecology, migrant concerns, development, and disaster management. 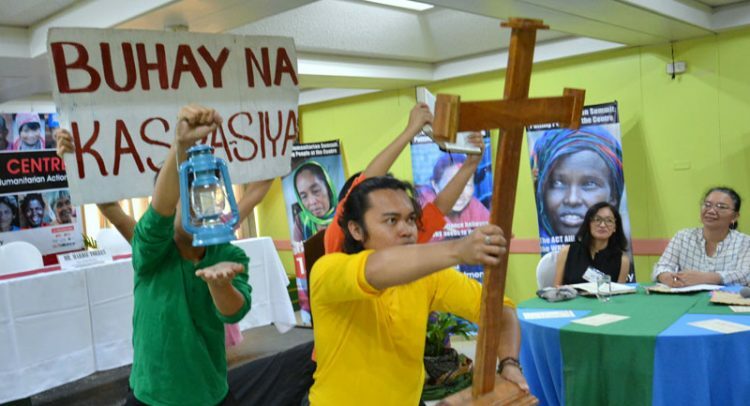 The FWS works locally, regionally and nationally to mobilize church people to work for peace and human rights, active participation in international alliances i.e., Ecumenical Advocacy Alliance and ACT Alliance. The direct service component of FWS is aimed at providing emergency assistance to disaster-stricken families and communities, support for small community-based projects, material, financial, and technical solidarity support for workers on strike, displace urban and rural poor, families of victims of human rights violations.